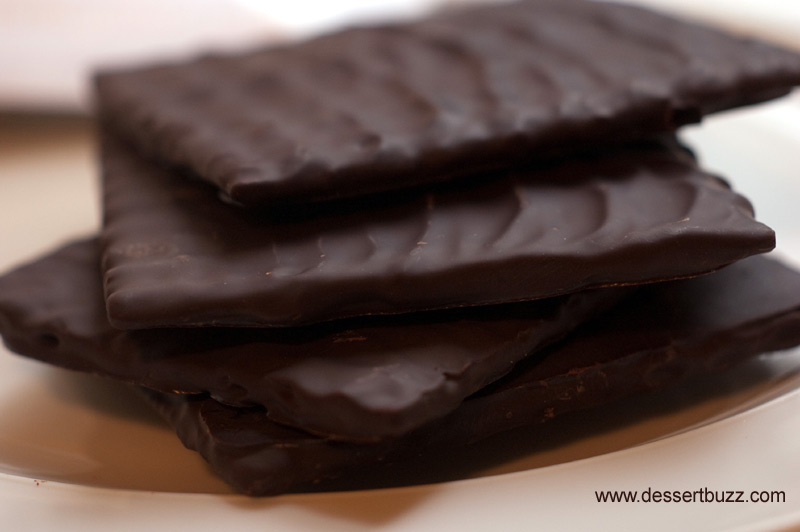 I’m not sure exactly what role dark chocolate covered matzo played in the original Passover seder. But if I ever had to flee somewhere, one of the things I would grab on my way out would be the nearest batch of good dark chocolate. It travels pretty well, doesn’t need to be refrigerated and provides valuable calories for long treks in the desert. Add in a little unleavened bread and you have a nutritious sandwich, chock full of antioxidants (ok maybe not that nutritious). I do know that if the Israelites had access to a Jacques Torres they would have equipped themselves with all 3 kinds of chocolate covered matzo’s: dark, milk and peanut butter. The small dark chocolate pack contains four, 3-inch square matzos and is a good deal for $5.00. The Dark chocolate provides a nice snap when cracked open. The matzo inside retains all of it’s crispness underneath the chocolate. 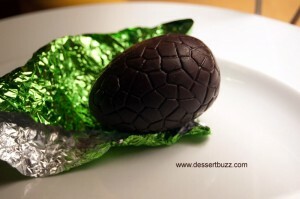 If the historical connection between Passover and dark chocolate matzo is murky then the record on chocolate covered peeps and Easter is even more muddled. Both Jacques Torres and Gristedes are selling dark chocolate covered Peeps right now. Surprisingly, the Torres Peep is the far better deal here given Christedes pricing of $0.99 for one, mylar-shrouded Peep vs. Torres 4-for $4.00, hand-dipped and gift-packaged version. Both use actual Peep brand flourencent-yellow colored marshmallow with Christedes selling a bird shaped Peep and Torres selling the rabbit shape. Both coat the marshamallow with dark chocolate but as you might expect the Torres chocolate is far superior to the shelf-stable covering on the Christedes Peep. 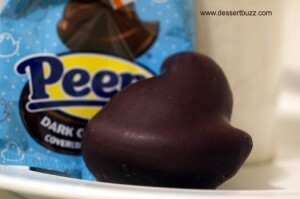 The Christede’s Peep was not bad but the dark chocolate was just a bit sweet for my tastes, I checked in my local CVS to see if they could be had for cheaper there but they didn’t carry it. 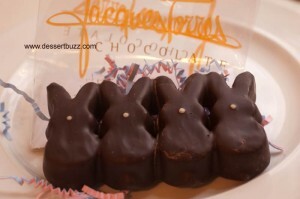 Jacques Torres has 3 locations in the New York City. I visited the Upper West Side location at 285 Amsterdam Ave (73 St.). The City Sweet Tooth » Sweet Links for the Week of 3/26! Umm, Peeps aren’t kosher for Passover. They contain corn syrup (gotta watch those grains on Passover), and gelatin (an animal product which is most often unkosher).